Marco Polo Algarve Holiday Map: the ideal map for your trip. Let the Marco Polo Algarve Holiday Map guide you around this gorgeous island. Highly durable and waterproof, this handy, pocket-size Algarve map folds away easily and is always on standby to help when you're stuck. Laminated finish - waterproof, durable and tear-resistant. This hard-wearing, little pocket map of the Algarve will withstand lots of folding and refolding. Pocket format - the handy, light-weight, pocket-size format contains full coverage of the Algarve. Easy to use - the super clear mapping in strong colours and clear text will help you navigate the region like a local. Perfect touring map - the scale is 1 : 150 000 perfect to help you tour the region if you're hiring a car or travelling by train. In addition there are detailed street maps of Albufeira, Lagos, Faro and Tavira and an overview map of southern Portugal. Practical tourist information - information on car rental, ferry lines and traffic regulations is also included. Top 5 regional highlights - Marco Polo's favourite top 5 activities, cultural highlights and natural sights are listed and cross-referenced to the map for ease of use. Ideal for short break, fly-drive and package holidays. Extensive index - the thorough index is fully cross-referenced to the map to help you find your destination with ease. Coverage - this is a detailed map of the Algarve. 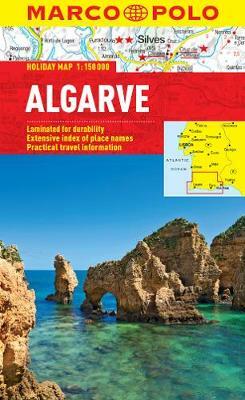 It also includes detailed street maps of Albufeira, Lagos, Faro and Tavira and an overview map of southern Portugal. Trust Marco Polo's clear mapping and thorough index to guide you around the wonderful Algarve.